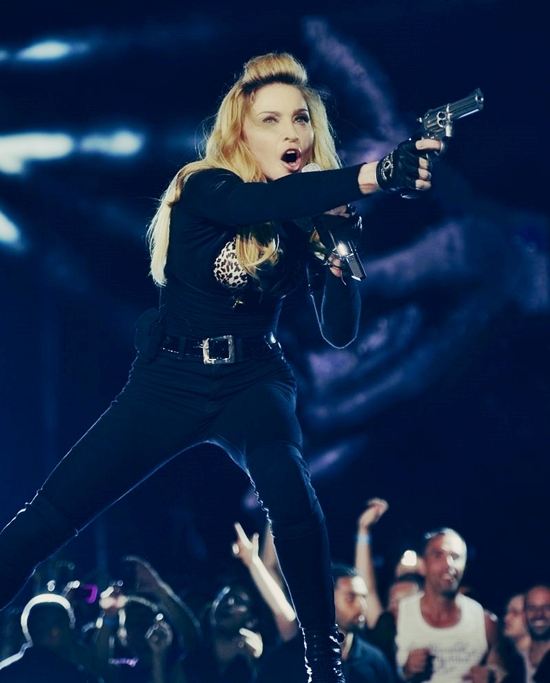 On August 27 2012, Madonna released a statement through her website in response to the controversy that had been sparked by some members of the American press who opposed her use of fake artillery as props in the MDNA Tour. The obvious irony being that the United States was potentially the only country her tour visited where real handguns are legally accessible to the general public. It is part cinematic musical theatre. Part spectacle and sometimes intimate Performance art. It’s true there is a lot of violence in the beginning of the show and sometimes the use of fake guns – but they are used as metaphors. I do not condone violence or the use of guns. Rather they are symbols of wanting to appear strong and wanting to find a way to stop feelings that I find hurtful or damaging. In my case it’s wanting to stop the lies and hypocrisy of the church, the intolerance of many narrow-minded cultures and societies I have experienced throughout my life and in some cases the pain I have felt from having my heart broken. That the enemy is within and the only way to survive Disappointment Disapproval Judgment Heartbreak Jealousy Envy And Hatred Is with Love – not with revenge – not with guns and not with violence. We cannot allow our anger or bitterness to swallow us up. There is an innate and pure love inside us all and we have to find a way to tap into it. And we can’t do it by being victims or placing the blame or pointing the finger at others. Then we can change the world without hurting anyone and we can inspire others to do the same. When you watch a film there are usually good guys and bad guys to help illustrate this point, Sometimes I play both. I enjoy acting out this journey. For none of us are perfect and we all have our own journey of growth to go on. I know people can relate to it. It’s very important to me as an artist that my show not be taken out of context. It must be watched with an open heart from beginning to end. I am sure if it is viewed this way, the viewer will walk away feeling inspired, Invigorated and will want to make the world a better place. In spite of its faults, I loved MDNA! It is a trip from darkness to light-maybe that’s why I’m still a fan today! Love Madonna!